Seattle, on Puget Sound in the Pacific Northwest, is surrounded by water, mountains and evergreen forests, and encompasses thousands of acres of parkland (hence its nickname, “Emerald City”). It’s home to a thriving tech industry, with Microsoft and Amazon.com headquartered in its metropolitan area. The futuristic Space Needle, a legacy of the 1962 World’s Fair, is its most recognizable landmark. The Statue of Liberty, a small replica of the original “Liberty Enlightening the World” in New York City, was a gift from Reginald H. Parsons and the Seattle Council of the Boy Scouts of America in 1952. The statue has become such a symbol of liberty and courage that it became a place to mourn, to reflect, and to leave mementos after the terrorist attacks of September 11, 2001. The newly cast and long-awaited Statue of Liberty for West Seattle’s Alki Beach will be unveiled by Seattle Mayor Greg Nickels and Seattle City Council member Tom Rasmussen at 6 p.m. Tuesday near the bathhouse in the 2700 block of Alki Avenue Southwest. The new statue replaces the one damaged by vandals in early 2005. The beloved neighborhood landmark was a gift to the city from the Boy Scouts of America in 1952. Over the years, the wind, water and salt air deteriorated the copper covering of Alki’s original statue. In the 1990’s the liberty deli gathered donations to make repairs and to eventually recast the statue. In 2004 the northwest program for the arts began a new effort to recast the statue by selling inscribed bricks for a new plaza and pedestal. 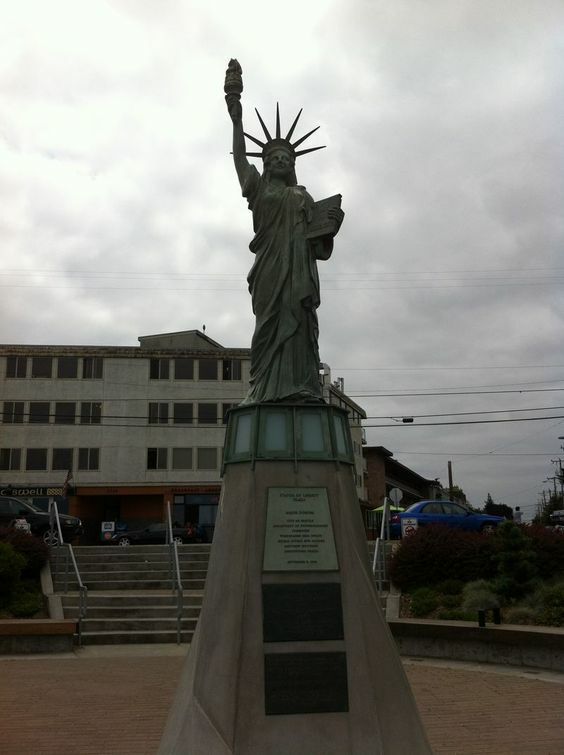 In 2006 the statue was recast by the bronze works in Tacoma. Further fundraising to complete the plaza was accomplished by the Seattle statue of Liberty plaza project, and their fiscal sponsors, urban sparks, in partnership with Seattle Citizens, Seattle Parks and Recreation, and the City of Seattle. This monument stands as a symbol of the freedom and love of liberty in which we all believe, and is a testimony to the citizen activism, and the generosity of spirit of the Alki Beach community, donors from Seattle, and across the country. The new plaza was dedicated on September 6th 2008, Libby and Paul Carr, co-chairs, Seattle Statue of liberty plaza project. Greg Nickels, mayor, city of Seattle; the Seattle City Council; Tim Gallagher, Superintendent, Seattle Parks and Recreation. Architects: Matt Hutchins, Cast Architecture Christopher Ezzell, E Workshop. Landscape Architect Susan Black and associates. The original sister can still be seen at the Carriage House Gift Shop in Seattle at the intersection of SW Stevens and 61st Ave SW.
We have not visited this site and we would be grateful for any images and/or information about the history of this sister. The image used courtesy of pinterest.com. Please use our online form to submit your information. We really appreciate any and all assistance we can get on this!